Use Retrieved User Name as Principal Checked User login IDs are usually case insensitive. This flag is required so that the subject established contains the user name as stored in the OID. 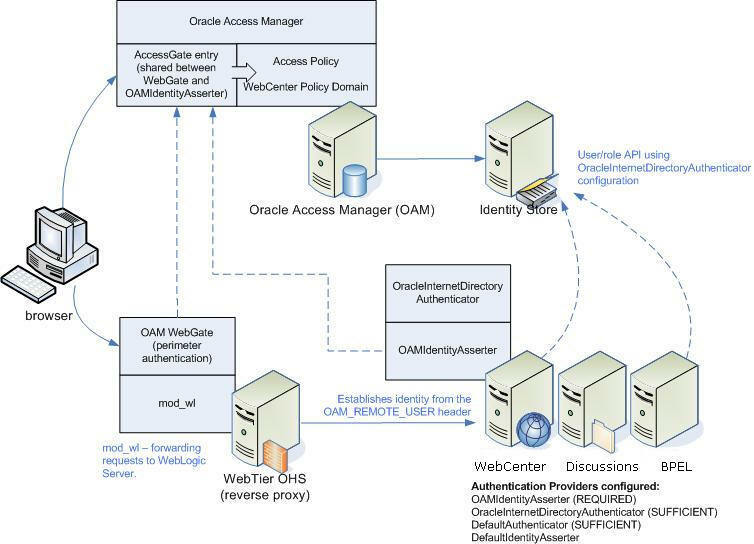 oracle.webcenter.spaces.osso true This flag tells WebCenter that SSO is being used, so no login form should be displayed on the default landing page. Instead, it displays a login link that the user can click to invoke the SSO authentication. Assuming that you've already set up a Worklist connection, modify the URL to use the Web Tier host and port instead of the SOA server host and port. You can do this using Fusion Middleware Control or using WLST commands as described in Section 22.4, "Setting Up Worklist Connections." Typically when you use the "Edit with Word" or similar features for MS Office products, the WebCenter Sharepoint application obtains the host name and port name from the current request. However, in this case the Sharepoint application needs to be routed through the virtual host requiring that some system properties be set in setDomainEnv in the WebLogic domain. For a cluster setup, be sure to change these properties on every machine. Navigate to Office icon > Server > Document Management Information and click Open Site in Browser. This should open the group space to which the document belongs in your default browser. Note that you will be prompted with a BASIC authentication challenge as MS Office integration has a restriction where it needs to go to the same URL as the one for the document. You will then be redirected to the group space through webtier.example.com and be prompted for to login if not already logged in.